This week at CrunchGear, we’re looking back at some of our favorite gadgets from the not-so-distant past — old phones, computers, media players, toys… those devices that still stand out in our memories despite their obsolescence. Feel free to contribute some of your own nostalgia. Back in 2001, I got a surprise Christmas present from my parents: a Sony MiniDisc recorder. It was a device I had barely even heard of, and certainly hadn’t asked for. But within a matter of weeks I was pleasantly surprised with how much use I would get out of the little device. The MiniDisc format was launched by Sony in 1992 as a digital competitor to recordable analog cassettes. MiniDiscs are basically more compact, versatile recordable CDs. In a time before iPods, I found my MD player to be a useful way to have portable music mixes without needing to lug around my clunky Discman knock-off. The downside: the MD player could only record in real time, meaning I had to plug the recorded into my PC’s audio output, press record, and play the entire Winamp playlist. In a way, it was the same as carefully crafting mix tapes in the 80s and 90s. To compete in the burgeoning mp3 players market, including, of course, the iPod, NetMD models introduced after 2001 put more emphasis on quickly syncing music from one’s computer. But these lacked the ability I was most interested in: live recording. While MiniDisc was quite popular in Japan, it never really made it in the U.S. Before mp3 players made it big, burning CDs was still easier and cheaper than recording on MiniDiscs. Then the iPod and other solid-state mp3 players overtook MD in storage capacity and price, and the MD format was not widely adopted by record labels as a venue for album releases. I still have a fondness for the little device, but its functions have mostly been replaced in my life by other gadgets. I use an iPod for portable music and a simple tape recorder for recording interviews. As a new parent (and resident of rural Iowa, at least 2 hours from any major music venues), I don’t attend – let alone record – many rock shows. At home, it’s easier to fire up GarageBand to record a song of my own. 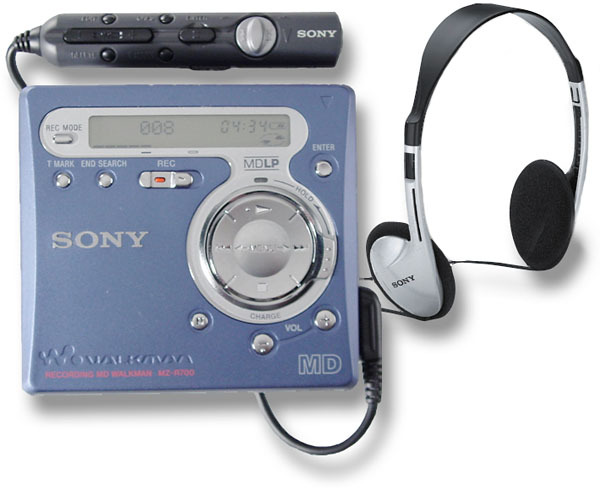 Sony now makes only one MiniDisc model, the MZ-RH1, which features improved sound quality and storage capacity. It combines the features that made previous MD players appealing separately, notably the ability to record as well as transfer data quickly.